At Bark, it’s our mission to get you the most relevant leads possible to help you succeed in business. We know how frustrating it can be reviewing requests which don’t quite match what you do and where you work. So, we’ve been listening to your feedback and developing innovative new features to enhance your experience on Bark. No one knows your business better than you. That’s why the some of the most popular features we’ve developed this year are self-service tools. They’ve been designed to help you define your Service Areas more precisely, and automatically filter out Barks which don’t meet your criteria. Why not take a few minutes to try out these features for yourself? 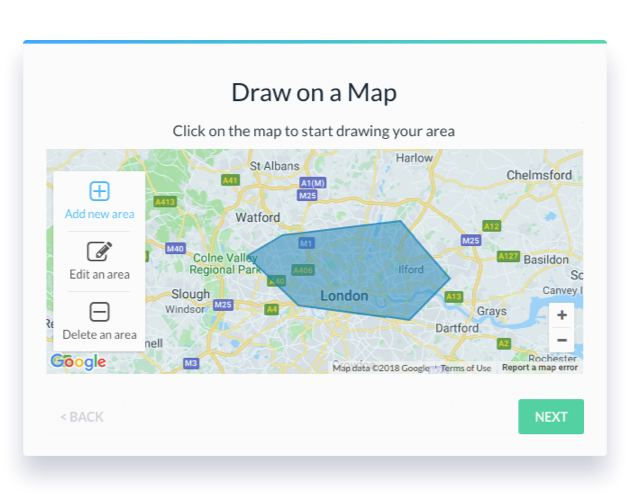 With just a few clicks, you can draw the area you service on a map – all done in a matter of seconds. You’ll then receive Barks from buyers who are local to that area, and automatically filter out those who are too far away. Travel Time is another great tool for filtering out those (hopefully rare) leads that come from far distant lands. 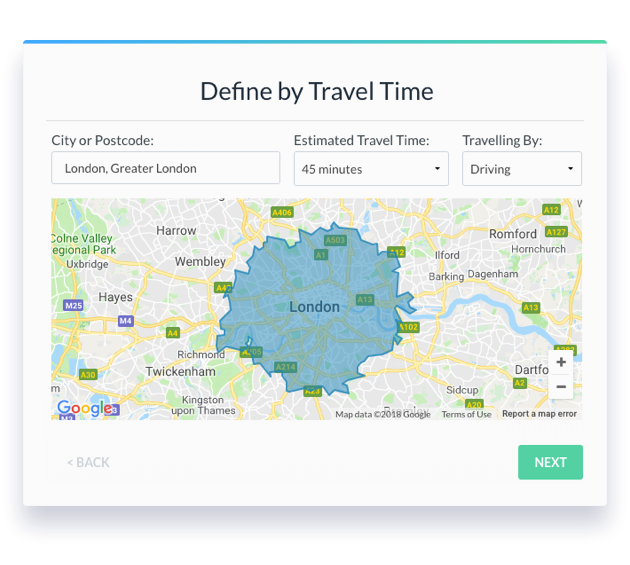 Simply set the area you cover based on your preferred travel method and the maximum time you’re willing to spend travelling to a job. We’ll send you leads based on the time it takes to walk, drive or take public transport from your location. As you know, when a buyer places a Bark we ask them questions to find out precisely what kind of service they’re after. We then match the request with a relevant service provider and send a lead. But it gets tricky to make an exact match when professionals in a given category offer similar but slightly different services to one another. 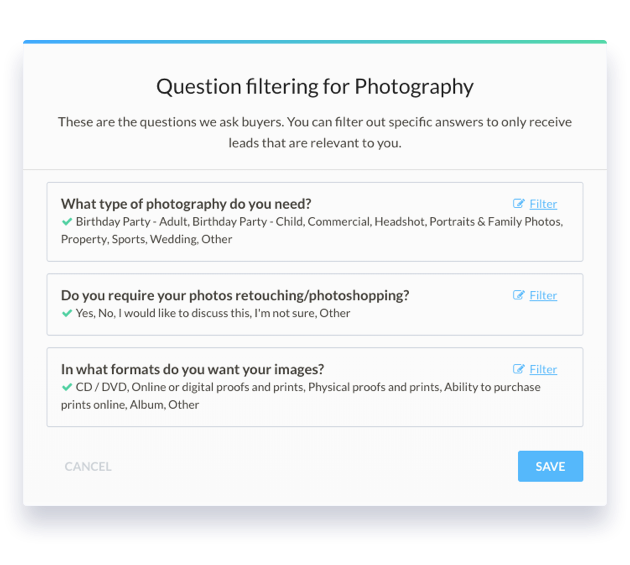 Now, with Question Filtering, you can manage questions at a granular level to ensure leads correspond exactly with the services you provide. For example, if you only have availability on certain days of the week, you can filter out leads requesting pros on your day off. We can even get more granular than that. If, for example, you’re a male personal trainer, you can filter out leads which specifically request a female personal trainer. Set your Question Filtering so you’re only alerted when we have a perfect match. With our new Seller Suggest feature, it’s easier for buyers to discover sellers on Bark, and easier for you to get new customers. From time to time, we’ll suggest your business to customers looking for your services, for free. If the customer is interested, you’ll be notified and invited to respond – and then it’s up to you if you’d like to pay to be introduced. Of course, in the meantime, you’ll still receive the leads that match your service areas, as usual. There is a significant ‘first mover advantage’ on Bark. Our data shows that you are 48% more likely to get hired if you’re first to respond to the buyer. 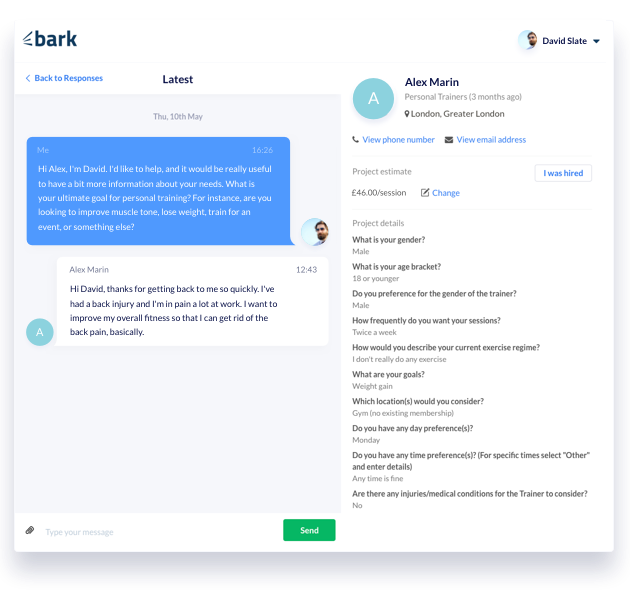 We know every second counts when responding to hot leads, so we’ve made it quicker and easier than ever to secure new business with Bark. 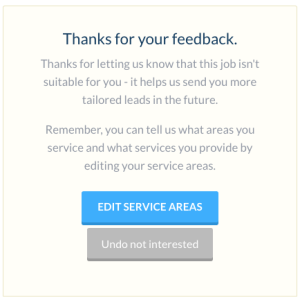 Following your feedback, we’ve created a simple one-click feature, so you can respond to a great lead within seconds. Simply click ‘submit your details’ to jobs you’re interested in – we then instantly send your details to the client and release both their phone number and email address to you. You can still send a personalised follow up message and quote when you’re ready. Don’t forget to top up your credits – the next introduction you make could land you a new customer! We’ve redesigned the messenger feature on Bark. The new look and feel will help you manage leads, conversations, briefs and quotes with buyers more easily. If you’ve loved using Bark, why not give your friends the opportunity to enjoy the same success? 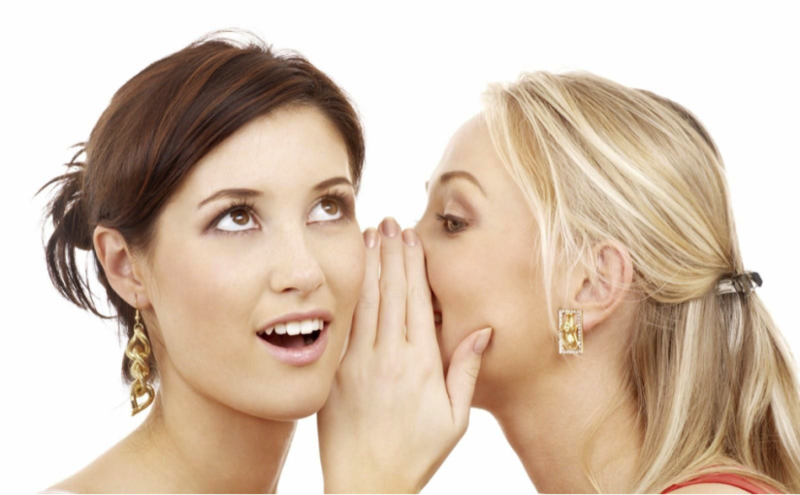 Simply refer a friend, and you’ll be rewarded with credits to spend on high quality leads to grow your business too. 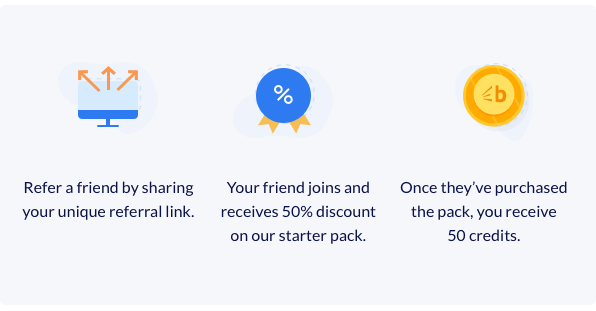 There’s no limit to the number of credits you can earn, and you’ll be rewarded each time someone you refer signs up and purchases our starter pack. If that’s not enough, we’ll also give anyone you refer a massive 40% discount to help them get started. We’re confident Bark will be a great help to any seller who tries it. We cover over 2,000 categories and deliver leads from interested customers to thousands of businesses every day. You can refer anyone you like from any industry, from babysitters to plumbers, web designers to bookkeepers. It’s so easy – you can invite people directly from your address book, or use the unique personal link we’ve created for you, which you can share on Facebook, in email or anywhere you choose. What do you think of our new features? Share your thoughts in the comments. Professionals covering large service areas – or providing many different services – often receive a high number of requests through Bark. 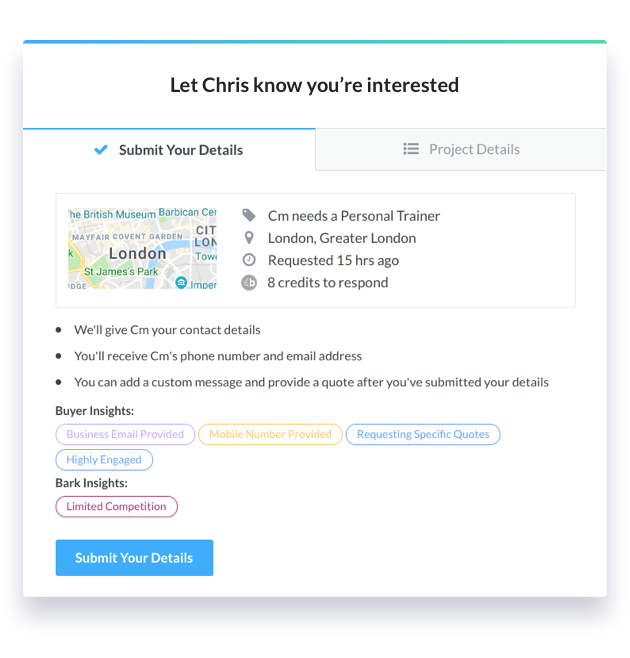 So we created a brand new tool to make sure finding the jobs you want to pitch for is always easy. It’s called “dashboard search” and it lets you quickly filter the requests in your Bark dashboard to find the jobs you want to do the most. Simply use the brand new search bar at the top of the page in your Requests tab to specify exactly what you’re looking for and find the best customers for your business. This new search bar lets you filter your matching Barks by: 1) when they were submitted, 2) what they cost to respond to, 3) which category they were placed in and 4) where the job needs doing. This last feature will be especially useful if you cover a large service area but are most interested in jobs from a specific location, such as your home town. ‘Dashboard search’ lets you pick out all kinds of customers with the click of a button, from massage clients looking for a male masseur to wedding photography clients within three miles of your home and more. That’s why we believe it will turn your Bark dashboard into a tool you can use whenever you like to find the best customers for you – whether you’re out on a job, or relaxing at home in front of the TV. So spend some time today getting to know your new dashboard and using it to find the best customers on Bark. With many of our pros generating thousands of pounds a month using our platform, it’s easy to see why Bark is fast becoming the UK’s favourite lead generation service. Professionals throughout the country use us on a regular basis to find new customers and grow their business – from wedding photographers in Birmingham to magicians in Canterbury. To show you why more businesses join our platform every day, here’s a closer look at what makes Bark customers the best leads for your business. As a professional on Bark, every potential customer we alert you to is actively seeking the services you provide. We invest heavily in online campaigns to find people looking to hire everything from balloon twisters to criminal lawyers, and then use ‘service areas‘ to match them with skilled professionals in their area. But if you’ve ever run your own PPC campaigns, you’ll know most people who click these ads aren’t serious about buying your product or service. So the first thing Bark does is filter out everyone who’s not really serious about paying for your services. If they click our ads but don’t finish placing their Bark, you’ll never hear about them. When we find a customer who needs a service you provide, we then ask them a series of questions about the job they need doing. At this stage, we also run a series of checks to ensure that they’re serious about hiring someone – such as checking their contact details are valid and ensuring they’ve filled out our questionnaire correctly. With other marketing methods, you’ll often end up paying to receive enquiries that aren’t right for your business, but Bark is different. If you’re busy on the dates the customer needs the work done – or if you just feel the job isn’t something you’re interested in – you can simply ignore the request and wait for something else to come along. 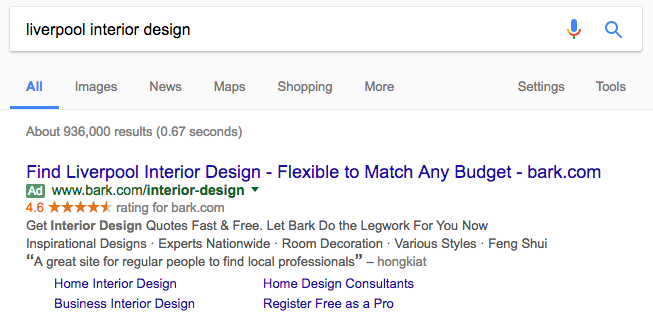 When you see a job you’d like to pitch for on Bark, click the “CONTACT” button next to their request to send the customer a tailored message and access their personal phone number. With thousands of people using Bark every day to find everything from plumbers to web designers, event performers and more – there’s never been a better time to join our service. You don’t have to pay subscription fees and we don’t take any commission on work you secure through our platform. So, once you’ve responded to a Bark, everything you make from the business is yours to keep. So why not join the thousands of small businesses who are already profiting with Bark today? Claim your FREE account now and start hearing about customers in your area right away. Our new-and-improved trades categories make it even easier to secure new business with Bark! We launched 300 new-and-improved trades categories this week, to make it even easier to find great leads for your business with Bark. As well as many services that are brand new to our platform, we’ve divided general categories (e.g. plumbing) into specific job types (e.g. bathroom repair, or leaking and burst pipes). We believe this approach will make it even easier to find new customers with Bark – and today we’ll look at what these changes mean for your business. By making our general trades categories more specific, we hope to give you a much clearer idea of what each customer is looking for before you respond to their Barks. Where previously someone might have placed a Bark for a builder, they can now specify exactly what type of work they need doing – whether that’s concrete levelling, block paving installation or anything else. This will make it much easier for you to decide if a job request is something you want to help with before you respond to it. Splitting the requests placed on our site up in this way also helps us ensure the price of responding to a Bark reflects the value of the job the customer needs doing. For example, we know a pipe repair job is worth less than a full bathroom remodel – so these new categories will help us make sure smaller jobs are cheaper to pitch for than big ones. Last, but not least, these new categories will help us make sure we only alert you to the best leads for your business. Imagine your company offers wallpapering services, but not shelf installation. 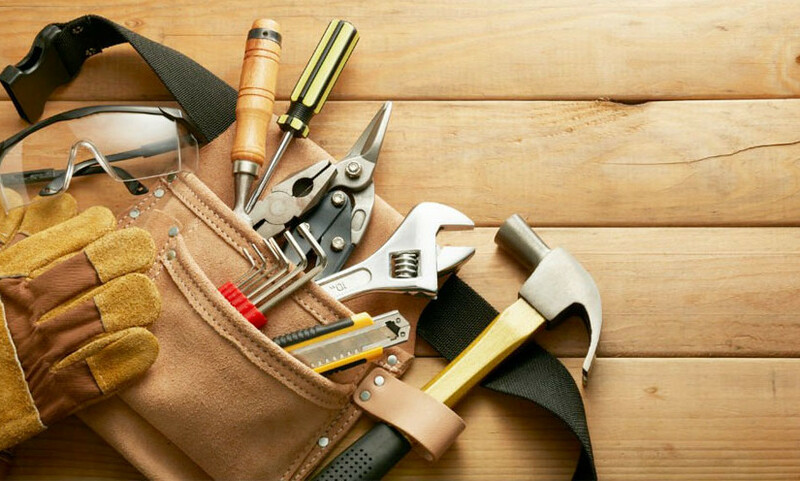 In the past, these jobs would have both come under ‘handyman services‘ – but now you can use our new trades categories to specify that you’d like to hear about one and not the other. Our registered pros are already signed up to hear about relevant Barks in our brand new trades categories. If you’re new to Bark, you can join them today and start hearing about potential customers in your area completely free. Click the link below now to claim your free Bark account and start growing your business with our service right away. Get the best leads for your business now. Posted on January 10, 2017 January 10, 2017 Author John Oberlin-HarrisCategories All, Bark News, For BusinessesTags Builders, Gardeners, Handyman, plumbers, Specialist Tradesmen2 Comments on Our new-and-improved trades categories make it even easier to secure new business with Bark! Ask any professional magician where they find new customers and, until recently, they’d have told you all their work comes through word of mouth. But that’s rapidly changing, thanks to online marketplaces like Bark. 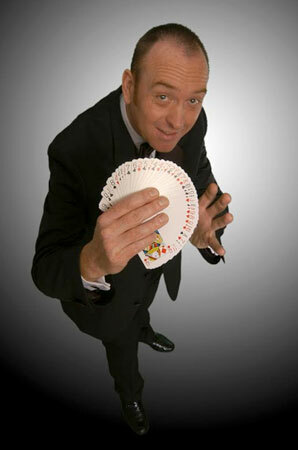 It’s Magic Time‘s Tony Charles is one of thousands of UK magicians who are transforming their businesses with Bark. He joined our platform in July this year, and has been using it to find new customers ever since. 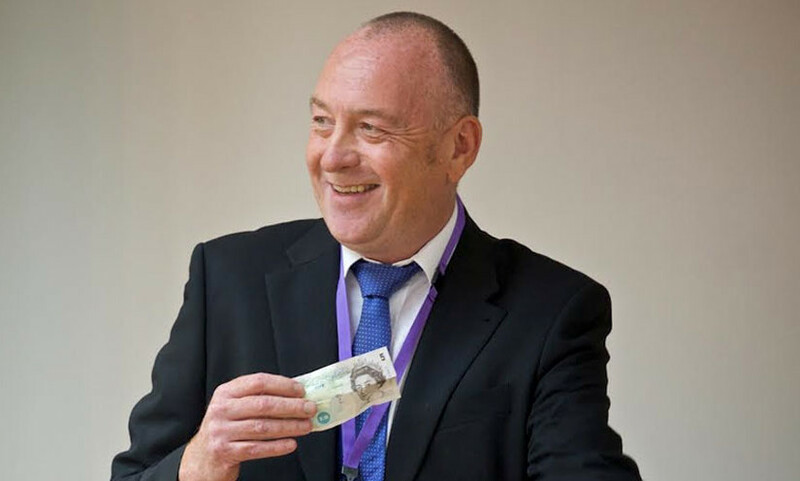 Tony says his first seven bookings with Bark are worth more than £1,000 on paper. But, as he explains, the value of a booking through our platform goes far beyond the fee for the job itself. Now he’s got to grips with the Bark platform, Tony says he’s finding it easy to find new clients. In fact, he’s already secured another three jobs through Bark since we interviewed him. When asked what advice he had for other magicians thinking about giving Bark a try, he said the best thing would be to certainly give it a try. Bark is fast becoming the UK’s leading platform for businesses seeking new clients in a wide range of industries – from entertainers to tradespeople, business professionals and more. With over 600 different categories to choose from, businesses of all shapes and sizes can find new customers quickly and easily with our service. 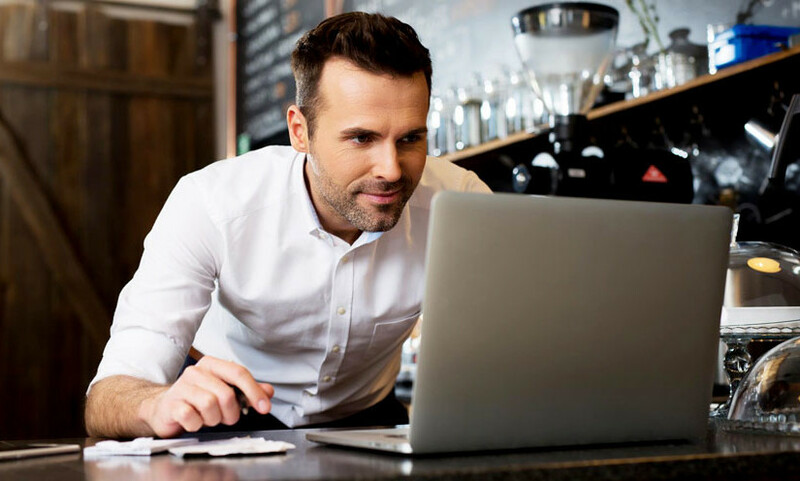 Join our network of 80,000+ registered businesses today and we’ll start alerting you to new customers completely free of charge – so you can see how easy it can be to secure new business with Bark. Click the link below now to claim your free Bark account and start hearing about customers in your area right away. Thousands of people throughout the UK use Bark every single day to find new customers and grow their businesses. Some use our service here and there to fill the gaps in their diaries. Others use us to generate thousands of pounds a month, often using Bark as their sole source of qualified leads for their business. But, in our experience, there’s one thing that all our best pros have in common, no matter how frequently they use Bark. They know how to make their businesses stand out by presenting clients with a great sales pitch. To help you get the most out of our service, we spoke to some of our most successful professionals to discover their biggest pitching secrets. Dom initially joined Bark because, unlike other lead generation services, it doesn’t cost a penny to open an account – and you can hear about customers in your area completely free of charge. Since then, he’s generated roughly £10,000 using our service, and says the key to his success is his ability to quickly form relationships with customers. Having been in business for 11 years, Janet Gow has historically been wary of lead generation companies – but after a great experience with Bark, she’s now changed her tune. John Austen from Marvel Booths agrees Bark has the potential to help small businesses grow exponentially. He says the best advice he can give to someone who’s thinking about signing up to Bark is to just give it a go – so long as you remember to treat it the same as you would any other part of your marketing strategy. We hope this article has given you some fresh insights into how our most successful pros pitch for business on Bark. 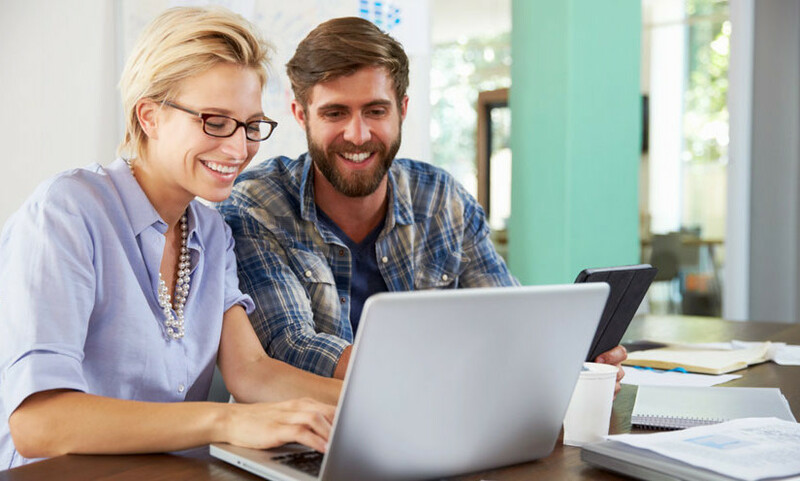 Put their advice into action today and soon you too could be growing your business online with our qualified lead generation service – just like Dom, Janet and John. If you’re new to Bark, you can start hearing about customers in your area completely free, so you can get a feel for just how easy it can be to secure new business with Bark. Simply click the link below now and claim your free Bark account to start growing your business with Bark right away. Click here now to start growing your business with Bark. Word of mouth has always been a powerful tool for promoting your services to new customers – and it’s only getting more important as the services industry moves increasingly online. A full 88% of consumers trust online reviews as much as personal recommendations, according to SEO experts BrightLocal. They’re the first thing customers look for when hiring professionals online, and having great customers reviews can give you a real edge over the competition when pitching for new business. Today, we’ll show you why collecting reviews on Bark is an integral part of promoting your business online – and look at how you can start collecting great feedback on our site right away. The moment you start collecting great reviews on Bark, you’ll be awarded a Bark star rating. Not only will this appear on your Bark profile and in our pro directory, but it will also show when people search for you in Google. As digital advertising company WordStream notes, this boosts your online presence by making your profile distinct from the search results around it. That means, when people see your Bark star rating, they’re much more likely to click through to your business page. Better yet, they’re also much more likely to hire you when they do. Online reviews are critically important to the vast majority of online shoppers. For example, diners regularly check reviews sites like Yelp to inform their decisions when choosing somewhere to eat. Entrepreneur Magazine reports that more than 35% of shoppers say they’d never eat at a restaurant that had a 3-star review. What’s more, this Harvard study found that a 1-star improvement on Yelp can translate to a 5%-9% increase in revenue. That’s a big difference, and we’re already seeing exactly the same thing happening in the services industry as more and more people use Bark to hire great local tradespeople online. That’s why we believe collecting great reviews on Bark is an integral part of promoting your business online – and why we make requesting reviews from your customers as easy as possible. The more great reviews on your profile, the more confident our users will be that you can provide them with a top quality service – and the more business you’ll be able to secure using our service. We recommend asking each of your customers to review your services within 14 days of completing a job for them to ensure you’re still fresh in their memory. To do this, simply log into your Bark profile and visit the ‘Reviews’ tab in your dashboard. Once there, enter your customer’s email address into the reviews tool and click ‘invite’ to ask them to review your services. You can test it out right now by visiting your ‘Reviews’ tab and entering your own email address into the box provided. You can also start collecting great reviews today using the Bark Reviews badge. It makes collecting feedback easy by reminding everyone who visits your website to review you on Bark. Absolutely anyone who clicks your badge can leave a review on your Bark profile, even if they didn’t originally find you through us. To help you with this, we created this simple walkthrough. It looks at all the most popular website building platforms used by Bark pros like yourself – including WordPress.org, Squarespace, GoDaddy and more. Click here to log into your Bark profile and visit the ‘Badges’ tab in your dashboard and follow the simple steps provided to claim your new Bark Reviews badge right away. If you’d like any further help getting great reviews on your Bark profile, send us an email at team@bark.com or leave a comment in the space below! Want to hear about even more customers through Bark? Now you can! We receive emails all the time from pros asking to hear about even more clients looking for their services. Specifically, many people want to be alerted to customers from further afield than our Service Areas tool allowed. There’s clearly a demand for larger service areas, so we decided to see what we could do about it! 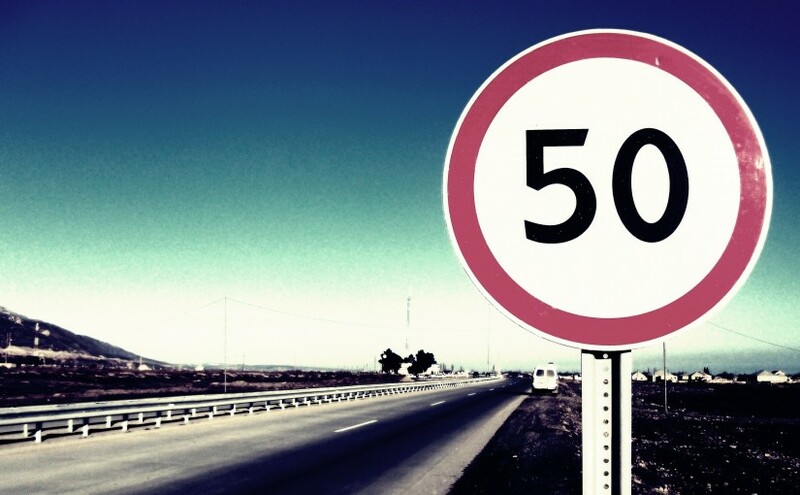 Due to popular demand, we’ve expanded our services areas to a 50-mile radius! 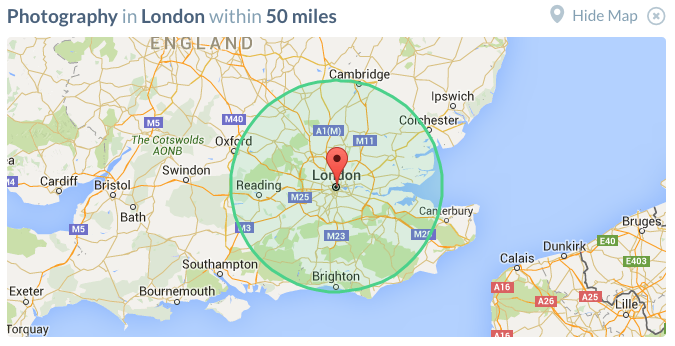 1) We’ve expanded the maximum service area size you can set in your Bark profile to a 50-mile radius. 2) When we alert you to a job you’re not interested in doing, you can now hide that Bark so it no longer appears in your dashboard. To hide someone’s Bark, simply click the ‘I’m not interested’ button in their public Bark and it will disappear from the list of matches in your dashboard – leaving you with just the jobs you’re interested in doing. Better yet, doing this sends us feedback that will help us tailor our service so we can provide you with better quality leads in the future. This new feature should prove particularly useful if you cover a large service area and are receiving a high volume of requests from us. We hope you find these changes useful, and that they’ll mean you can start winning more business than ever before with our service. So why not put them to the test right away? Log into your Bark profile here to widen your service areas and try out our new ‘hide Bark’ feature to filter through the leads we’re sending you. We’re always looking for new ways to improve Bark for you and your fellow pros, and later this month we’ll be sending out our summer Seller Survey to find out how you feel we’ve been doing over the past few months. Keep an eye out for it for your chance to tell us what you really think of our service. In the meantime, let us know what you think of these brand new pro features in the comments below! Posted on July 6, 2016 Author John Oberlin-HarrisCategories Bark News, For BusinessesTags Bark Seller Survey, Nationwide Barks, Service Areas2 Comments on Want to hear about even more customers through Bark? Now you can! We’ll now give you instant access to a client’s personal phone number when you respond to their Bark, making it easier than ever before to secure new business with our service. 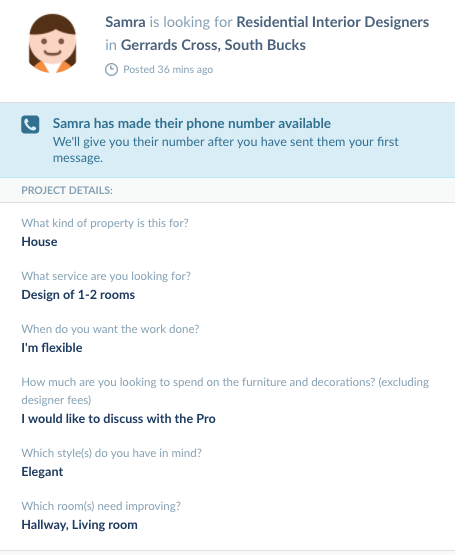 You’ll find each customer’s phone number beneath their name in the in the My Responses section of your Bark dashboard – so you can use it to call them directly. But, from time to time, you’re bound to reach someone’s voicemail. To help you prepare for when that happens, we put together this simple guide to leaving the perfect voicemail pitch in five easy steps. Most people delete these messages straight away. If you recognise the company, you probably already have an opinion about who they are and what they do – and if you don’t, you usually don’t care who they are anyway. A far better approach would be to take advantage of the specific information we send you about what each of our clients is looking for. At this early stage, it’s really too soon to be going in for the hard sell. You’re just trying to get the customer to call you back to discuss their needs further – and for that, you need to capture their interest. You might do this by explaining how you’ve helped people with similar requirements in the past, by running through any qualifications you have that make you perfect for the job, by stressing the benefits of choosing your service over your competitors – or all of the above. Ultimately, the aim here is to present yourself as the best pro for their needs, and focussing on the specific details in each client’s public Bark is a great way to do this. 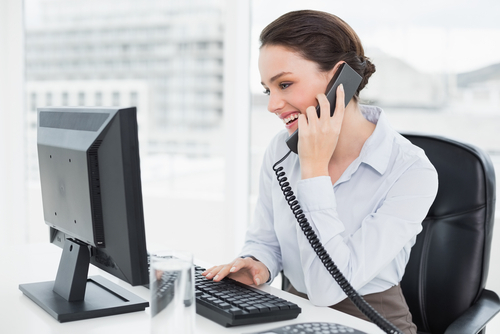 It goes without saying that you should end your voicemails by giving your name and contact phone number. This is your ‘call to action’ – so be sure to state your number slowly, repeat it twice, and lead into it with the phrase “Please call me back on”. One thing that works really well at this point is to give your client a specific reason to call you back. For example, if you were responding to a catering Bark, you might ask the client to call whenever is convenient so you can create a bespoke menu together. People don’t typically look forward to receiving voicemails from unknown numbers, and if your message is way too long (or too short) it’s possible they could delete it without even listening to it. Inbound marketing experts HubSpot recommend aiming for the 20-30 second mark as a good rule of thumb. This should give you plenty of time to deliver your pitch, without taking up too much of the client’s time. Remember, if you don’t hear anything back in a few days’ time, you can always follow-up again by text, or use the Bark Messenger to ask when would be convenient for you to call back. Last but not least, always know what you’re going to say in advance. Before you even pick up the phone, give yourself a few seconds to summarise the purpose of your call in one or two sentences. This will help you avoid long pauses and unnecessary stammers should the call go to voicemail, and will ensure you’re always ready to deliver the best pitch possible for your business. Sticking to these five simple steps should maximise the number of call-backs you get from your voicemail sales pitches, so you can win even more business thanks to our service. Why not put them to the test right now by logging into your account here and reviewing your latest matches? Or if you have any extra voicemail pitching tips or feedback about this latest upgrade to our service, let us know in the comments below! The best wedding photographers are masters of networking. They know the key to success is to be constantly meeting new people who might want to do business with you. When you get down to it, the traditional avenues photographers use to grow their business online – blogs, SEO, social media and the like – are all types of networking. But, much like networking in real life, they can be time consuming. You can introduce yourself to dozens of new people without meeting a single potential customer. That’s what’s different about Bark – we’re a more efficient way to market your services online. By ensuring that everyone you speak to is actively looking for the services you provide, we’re helping thousands of independent British photographers grow their businesses quickly and easily online. 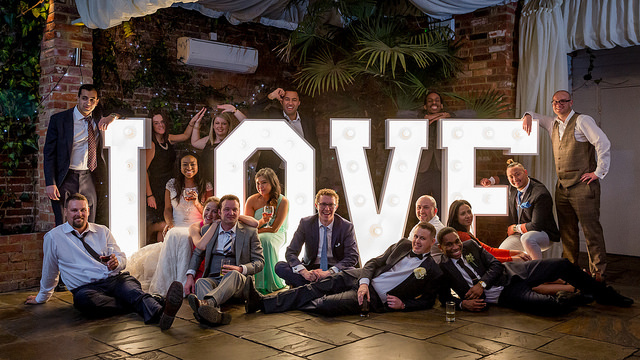 We invest heavily in online advertising campaigns to find brides and wedding planners throughout the UK – something that’s simply not an option for most independent photographers. Customers looking for wedding photography visit our site and let us know what they want, and we contact quality pros in their area on their behalf. 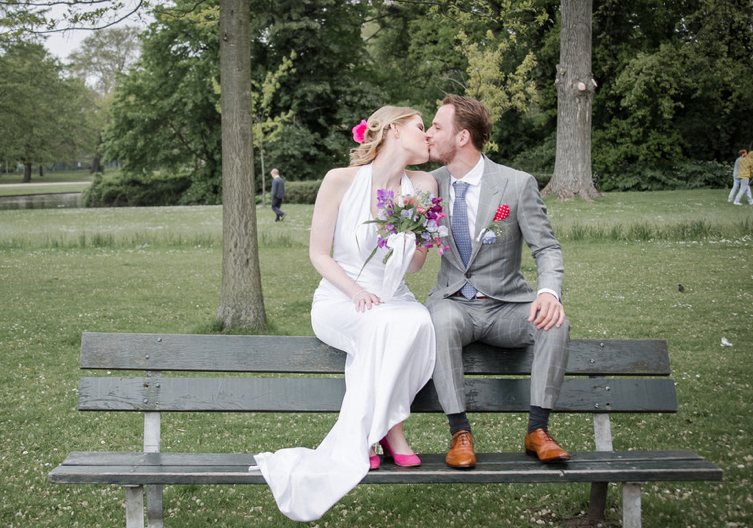 We’ve alerted Moritz to more than 200 customers since he joined the service in early 2015 – and he’s secured 20 wedding bookings through us in the first five months of 2016 alone. Moritz isn’t alone, either. Photographers across the country are enjoying huge success with our service – like Adam van Bunnens, who’s been alerted to over 600 potential new customers since he joined the service in September 2015. Simply click here and open a free account right away. Bark has grown rapidly since our founders Kai Feller and Andrew Michael started it in late 2014. Over 60,000 small businesses up and down the country are already registered with us and helping regular people find everything from window cleaners to legal representation. 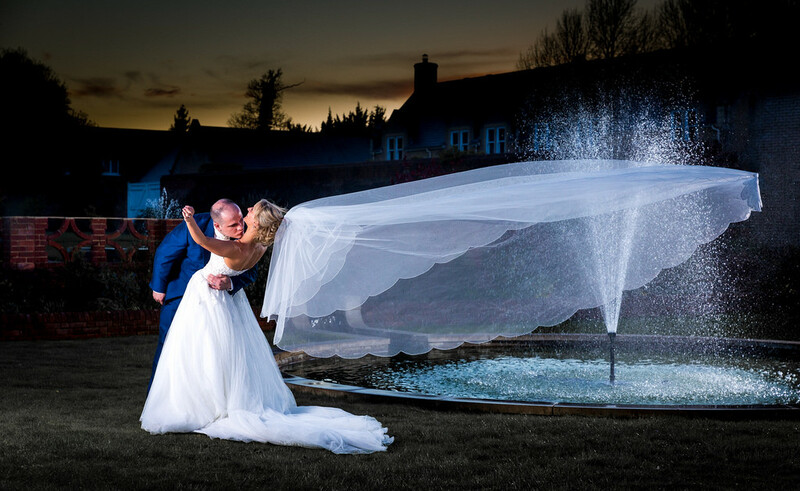 Wedding photography has proved to be one of our most popular categories, with more people turning to us every day to find the perfect pro to capture their special day. As such, we’re always looking for new pros to keep up with this rapidly growing demand, and if you think Bark could work for your business we’d love to welcome you on board. We’ll alert you to potential clients completely free of charge, so you can pick and choose the ones that work best for you. 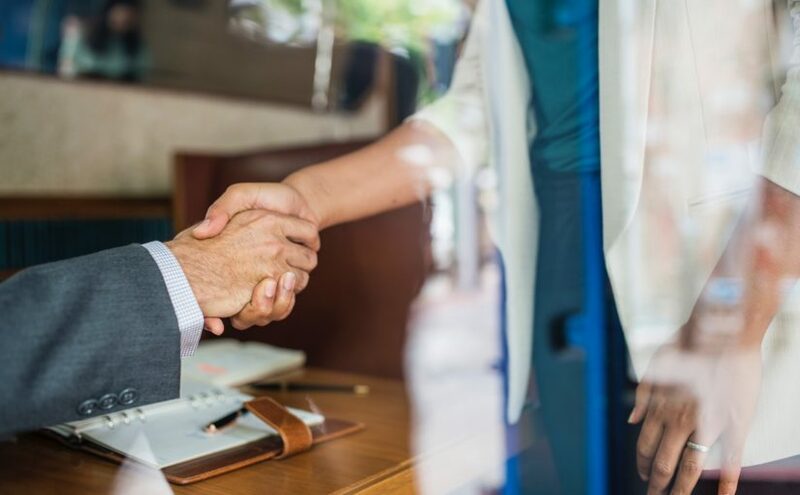 We don’t take any commission, and there’s no obligation to continue using our service after you’ve used your three complimentary introductions. So there really is nothing to lose – and potentially everything to gain. 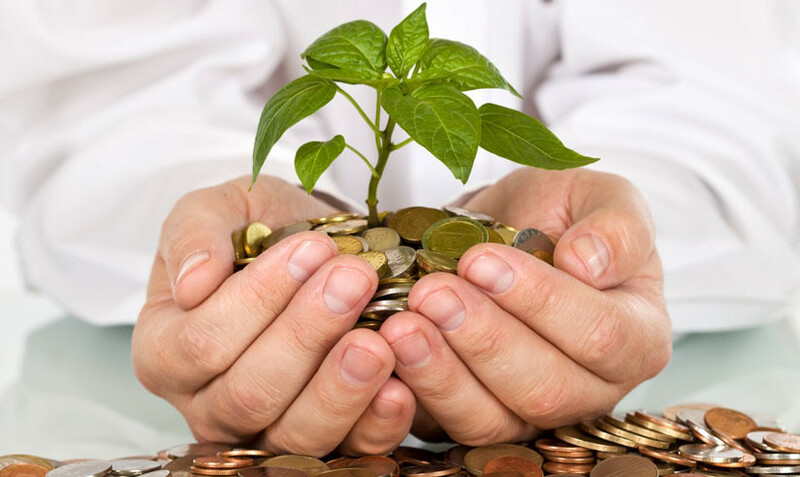 Click here to open your FREE account and start growing your business with Bark today.